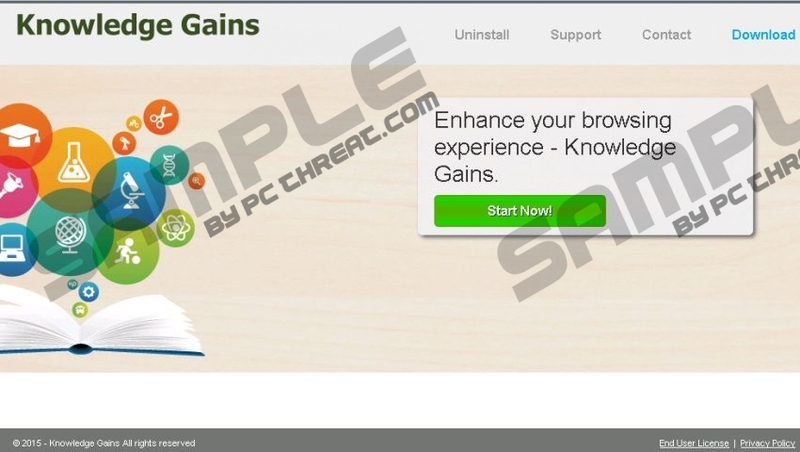 Knowledge Gains is yet another adware program that has been roaming the web lately. If you have noticed ads powered by this adware within your browser it is a strong indication that Knowledge Gains is active on your operating system. Just like any other adware application Knowledge Gains will cause endless annoyance and frustration as long as it is up and running on your PC. Even though, Knowledge Gains could be advertised as a great tool that should improve your online shopping experience, you must know that it will not do anything like that. In order to restore the standard functionality of your web browser, you will need to remove Knowledge Gains from your PC. Read the rest of this article and find out why the removal of this adware program is so important. During the research, it has been discovered that Knowledge Gains is yet one more adware program developed by the infamous SuperWeb LLC group. This group is known for having developed adware programs such as Product Deals, Ysearchservice, Coupon Time, iShopper, and quite a few others. Due to this information it is not surprising that Knowledge Gains functions in virtually the same way as its counterparts. Once Knowledge Gains enters your operating system, your web browser will be flooded with various third-party commercial ads and annoying pop-ups. This activity is random as ads and pop-ups will be presented on different websites whether you like it or not. It goes without saying that Knowledge Gains will make your life miserable as you will have to fight through ads and pop-ups every time you browse the web. While some ads might seem quite tempting, in reality, they are absolutely worthless and in no way will they help you shop online in an easier manner. In order to stop this annoying activity promoted by Knowledge Gains, you will need to delete this intrusive adware program from your PC. Use the removal guide and remove this adware application without any hesitation as it holds no beneficial features whatsoever. The removal procedure of Knowledge Gains is rather simple as you can delete this invasive adware program via Control Panel. Unfortunately, in some cases traces of Knowledge Gains could still be active on your PC, even though, manual removal was executed. In order to remove all the leftover files and registry entries, you must conduct an in-depth analysis of your PC for potential traces of Knowledge Gains. Right-click Knowledge Gains and select Remove. Double-click Knowledge Gains to remove it. Quick & tested solution for Knowledge Gains removal.